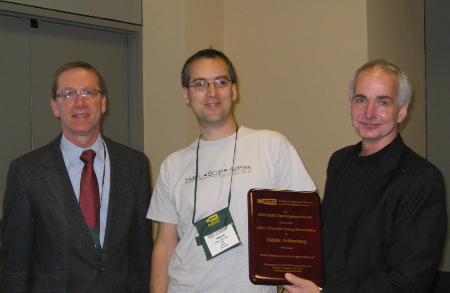 Jon Lee (left), Tobias Achterberg, and Jim Renegar. The vibrancy of optimization as a research discipline is due in part to a dichotomy between theory and practice, a healthy interplay that has long been embraced by the optimization community. Highly influential works by young researchers, however, almost always lean towards the theoretical (conceptual) side, bringing new vantage points rather than necessitating a deep command of a broad range of existing literature and techniques. With regards to computation in particular, it was virtually unthinkable to imagine a scenario where a young researcher introduces a general software framework that, when restricted to specialized problems, is nearly as efficient as top commercial codes designed specifically for those problems (codes that were under development for nearly the lifetime of young researchers). Virtually unthinkable, but not impossible, as was shown by Tobias Achterberg in introducing SCIP (a software framework for "solving constraint integer programs"), and in originating -- and recognizing the utility of -- the notion of constraint integer programming, which integrates constraint programming, mixed integer programming, and satisfiability modeling and solving techniques. Thus we are very pleased to announce that Tobias Achterberg receives the 2011 INFORMS Young Researcher Award for his paper, "SCIP: solving constraint integer programs" (Math. Prog. Comp. (2009) 1:1-41), which is exemplary among documents introducing new software in that it shows the forest as well as the trees, in that it clearly documents extensive testing against other software packages, and in that it contains an intriguing example of how the framework has been deployed in solving an especially difficult and highly important modeling problem in chip design verification.